Norman Burrows was born in 1914 in the Toxteth area of Liverpool, the oldest of three children. He joined the RAF in June 1941, but didn’t go to Air Gunnery School until the following year. 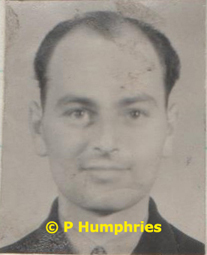 After qualifying as an air gunner, he joined 50 Squadron based at Skellingthorpe on 30 September 1942. He flew for the first time with Henry Maudslay on 27 January 1943, on a raid to Dusseldorf, and became his regular rear gunner, taking part in a further nine operations. On one raid, to Cologne on 2 February 1943, when they bombed from 19,000 feet conditions were so cold that his guns froze. The complete crew were transferred to 617 Squadron on 27 March 1943. Towards the end of the pre-raid training all the Dams Raid crews practised dropping dummy Upkeep mines at Reculver, off the Kent coast. Maudslay and his crew had been allocated Lancaster AJ-X (ED933) for the raid. Burrows was in its rear turret on 12 May when Maudslay came in at an altitude so low that, when the mine was dropped, the splash of water and shingle damaged the tailplane. This must have severely shaken up the gunner. The aircraft limped back to Scampton, but the repairs couldn’t be done in time. Fortunately another specially modified Lancaster, ED937, arrived the following day, and Maudslay was allocated it for the raid. It was given the code name AJ-Z. After being damaged at the Eder Dam, AJ-Z got as far as Emmerich near the Dutch-German border before being shot down. The body of Burrows, separated from his comrades by the length of the fuselage, was at least identifiable on its own, and he and the rest of the crew were buried in Dusseldorf North cemetery. After the war, they were all reinterred in Reichswald Forest War Cemetery.